*Please do not forget to mention the item number of this set. The story of how the Crane showed the Baawitigowininiwag (Ojibweg of Sault Ste. 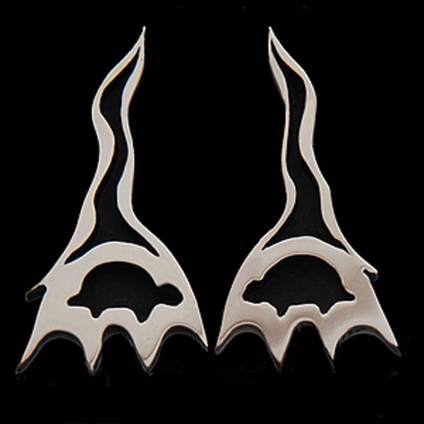 Marie) where to lay the foundations of a new community and new ways to organize their society, inspired me in designing this set of white gold and silver overlay post-back earrings. It is an abstract image of Crane resting on a turtle's back. Turtle symbolizes a hill overlooking beautiful Baawiting, which he chose as his resting place after leading the People all the way from the Atlantic coast to the promised land in the heart of the Great Lakes area. Viewed in a larger context, Mikinaak (turtle) represents Turtle Island, the American continent where the Great Mystery placed the Original inhabitants of the Land. Since he, after a devastating flood that swept Aki (the earth), served mankind by lending his shield for the re-creation of the world, Mikinaak has a special place of mediation in the worlds of the natural and the supernatural. After he had lent his back for creation, Nookomis Dibik-Giizis, grandmother moon, conferred on him special HEALING POWERS that have been held in reverence ever since! Go to our art blog to read more about the fascinating story of how my ancestors founded Baawitigong (Sault Ste. Marie).